ST. GEORGE — A 4.5 magnitude earthquake that occurred near the Utah-Colorado border Monday morning could be felt as far as 40 miles away in Moab, according to the Associated Press. University of Utah Seismograph Stations reported that the earthquake hit around 10:22 a.m. Monday near Slide Rock Canyon, about 7 miles southeast of Paradox, Colorado, and two miles southeast of Bedrock, Colorado. 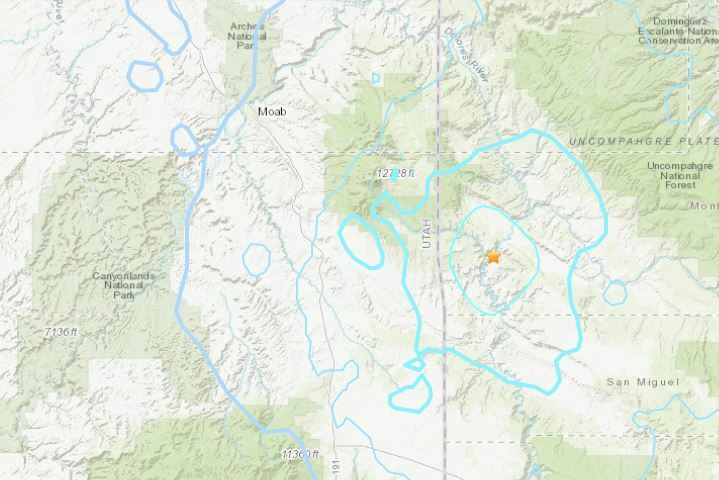 Moab police said there were no reports of damages as a result of the earthquake, but was widely felt across southeast Utah and southwest Colorado, according to AP. And little to no landslides or liquefaction are expected, according to U.S. Geological Survey. More earthquakes following today’s, known as aftershocks, are expected in the area throughout the week with a 54 percent chance of up to 20 quakes with a magnitude of 3.0 or higher, according to USGS. It also forecasts a 6 percent chance that another earthquake of at least magnitude 4.6 will happen this week. The USGS advises those nearby to be aware of the possibility of more earthquakes and to use caution around vulnerable buildings. The University of Utah Seismograph Stations reported that eight earthquakes of at least 3.0 magnitude have occurred within 16 miles of Monday’s earthquake, the largest of the eight, since 1962, according to AP. If you are indoors, stay there. Get under a desk or table and hang on to it (drop, cover and hold on) or move into a hallway or against an inside wall. Stay clear of windows, fireplaces and heavy furniture or appliances. Get out of the kitchen, which is a dangerous place (things can fall on you). Don’t run downstairs or rush outside while the building is shaking or while there is a danger of falling and hurting yourself or being hit by falling glass or debris. If you’re outside, get into the open, away from buildings, power lines, chimneys and anything else that might fall on you. If you are in a mountainous area, watch out for falling rocks, landslides, trees and other debris that could be loosened by quakes.